An email will be sent to the email address you have supplied on your order or you will be contacted by phone if you don't have email. Your Tax Invoice detailing any payments required prior to pickup will be attached to that email. If no email, it will be posted to you. Pickup from our Display Yard at 20 Wallace Ave, Point Cook is FREE. It is imperative that you pick up your building using a vehicle suitable for the purpose. It must be able to carry the weight and length of the packs, and must be able to be loaded by forklift. We will not load a vehicle that is considered unsuitable. 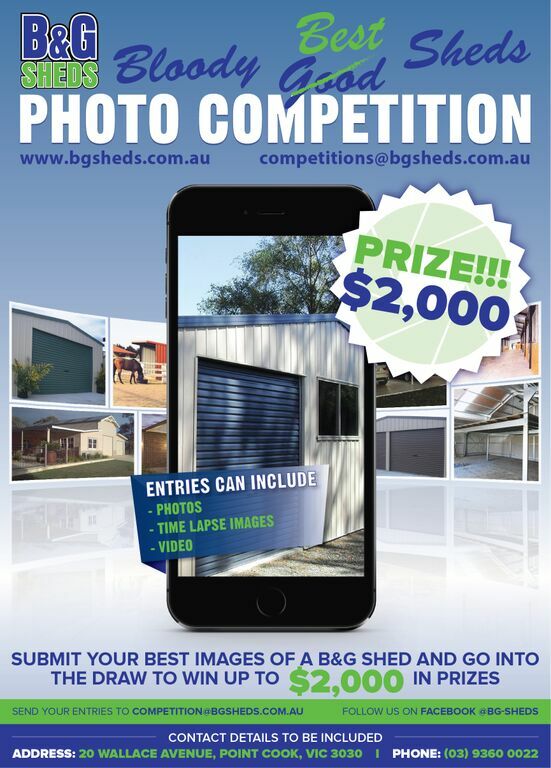 B&G Sheds will not be held responsible for any damage caused to a vehicle while on the premises, and cannot be held responsible for any failure to comply with applicable road laws. Please call and check with our staff if you are unsure whether your vehicle suitable. Our deliveries normally occur on our B&G Sheds Crane Truck which is a 9.0 Mt long tray truck. The delivery is just the driver and truck. has The building usually consists of one or more shrink wrapped packs of material that are usually around 4.5 x 1.0 x 0.8 Mt weighing around 800kg per pack. Roller doors, windows and other smaller items are able to be walked to a suitable storage area, but the main pack(s) must remain where they are unloaded. Due to the limitations of the crane, they are put down relatively close to the truck. The installation contractor will undo the pack and walk the material to the shed site (up to 30.0 Mt max) when he arrives. The driver requires clear access for the truck. If there are obstacles, he will get the truck as close as he can to the building site. Subject to reasonable access, the driver will attempt to put the materials at the customer's desired location. The customer should be on site to meet the delivery vehicle, direct the driver, indicate where he prefers the materials to be put, ensure the truck does not get bogged, and assist the driver in unloading. . If the owner is unable to meet the truck, the driver will unload all materials within six (6) meters of the truck. Generally our deliveries are targeted to arrive on site the week after the concrete floor for the project has been laid. We appreciate that having material on site any earlier is only an inconvenience for you and the contractors. Deliveries only occur on weekdays - excluding public holidays. Times are usually given as AM or PM. Delivery timeframes may change from time to time due to unforeseen circumstances, however we will contact you immediately should circumstances change. Should you be unable to collect or accept delivery of your purchase on time, a storage fee may apply. No claims for damage, shortages or deterioration of materials will be recognized unless submitted in writing within 7 days of receipt of materials. B&G Sheds will not accept liability for any claim arising from damage or loss of materials sustained by any carrier other than the company's own transport. The client should cover the materials to protect them from rain and /or absorbing moisture during the period between when the materials are delivered and when the building is to be constructed. The supplier will not be responsible for any deterioration of the materials should the Customer fail to protect the materials from the elements. The client shall be responsible for the safety and security of all materials once delivered to the site, and should take out insurance against theft or damage.